The more top class recordings from Jansons and the BRSO that appear, the clearer their relationship becomes. The orchestra is one of the greatest in the world, but they don't play this well for everybody. But the combination in Brahms of lyrical Romanticism and meticulously planned structure demonstrates how they achieve both: the orchestra provides the big sounds while Jansons provides the intellect. That sort of combination can lead to tensions between conductor and orchestra, but Jansons has been in Munich long enough for any such problems to be resolved. Most of the BR Klassik releases to date have been of fairly standard repertoire (Mahler 7 has been the most esoteric, which isn't saying much) but when the performances are of this quality whose to complain? Jansons knows that his orchestra can provide a compelling Romantic sound, whatever happens on the podium. He's not opposed to the orchestra's approach, but he does make sure that good taste prevails. The way in which he phrases the music with the minutest of dynamic and tempo changes perfectly complements the expressive tone of the orchestra. True, the results will be too sugary for some tastes, but there is real discipline here. The orchestra may not have learnt anything from the recent period instrument performances of Brahms around Europe, but Jansons certainly has. The result is the best of both worlds, both deeply expressive and intellectually rigorous. That said, there is nothing radical here, which may surprise Jansons-watchers, given his reputation for adding subtle twists to his interpretations of the classics. However, these readings are utterly convincing in every detail. Some of the inner movements of these symphonies can seem trivial and out of place in lesser hands, but not here – the conviction in every phrase ensures everything matters just as much as the furrowed-brow finales. The orchestra are both note perfect and satisfyingly distinctive in their tone. It is immediately obvious from the woodwind and brass sound that this is a central European orchestra. The brass are on top form, with an impressively robust horn sound and a trumpet section that often approaches levels of excess, but also knows exactly where to draw the line. The SACD audio is excellent. The orchestra are not in their usual home, the 2nd Symphony is recorded in Munich's Herkulessaal der Residenz and the 3rd in the Vienna Musikverein. It feels like heresy to write this, but I prefer the former acoustic. It is rounder and warmer than that of the Musikverein, and without any loss of clarity. Of course, the Musikverein sounds good too, it's just that its slightly dryer acoustic brings you down to earth a bit after the more opulent sound in the 2nd Symphony. 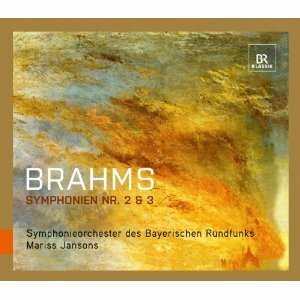 So, another highly recommendable release from Jansons and the Bavarian Radio Symphony. Great audio, a convincing (if traditional) interpretation, and above all, a great, great orchestra.